With the opening of Interstate 49, old Highway 71 through northwest Arkansas has lost most of its traffic. Formerly thriving businesses like the Smokehouse Restaurant near Mt. Gayler have folded up and slipped away in the night. Towns along this formerly packed thoroughfare have suffered losses as well, especially enterprises that depended on highway traffic as much as local customers to keep the black ink on their bottom lines. Soon after the new four-lane highway opened with its easier grades, straighter curves, and swooping (terrifying) bridges high above the mere mortals below, state and regional officials began marketing the old highway as the “scenic” route. And it is, without doubt, scenic. Crossing the Boston Mountains with their sheer drop-offs and stunning vistas never fails to inspire. Yet now more than ever, the underbelly of the Ozarks blossoms into view. Not so scenic are places where the property owners have lost the fight with their ‘stuff.’ Mounds of trash, some of it looking as though it was simply tossed out the door, litter their places of habitation. Old vehicles and various implements once used in the pursuit of livelihood sit haphazardly around the place. Cobbled-together homes make creative use of plastic sheeting and various and sundry bits of construction material. These places have become a regular irritant to some locals, one of whom took these photos and sent them to me after I said I’d write a blog post about it. Locals like us have long since accepted the fact that some folks either can’t or won’t make the effort to present a respectable front to the world. There’s no shortage of such scenarios along just about any dirt road you might care to drive. But along the highway, a highway advertised as “scenic,” these places paint the entire region with a dismal color of decay and poverty. 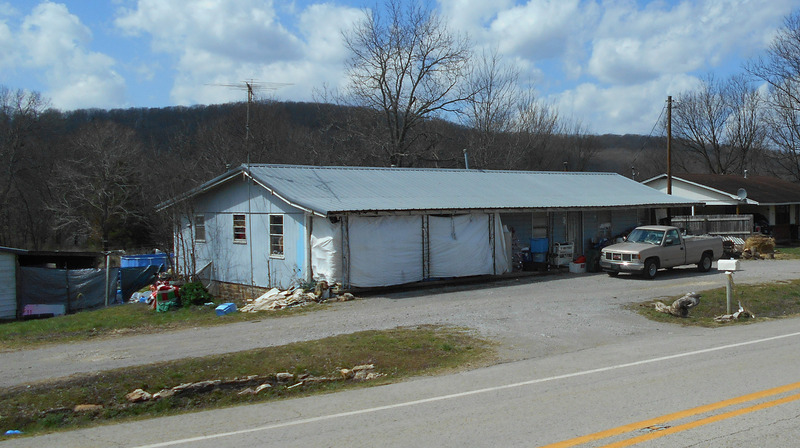 Maybe the world expects to see evidence of destitution and apathy in the Ozarks. After all, ever since the publication of the “Arkansas Traveler” song in 1840, this region has suffered the disdain of many for its slovenly ways. Even now the more ‘civilized’ regions on either coast consider all of the hill states to suffer similar inability to come up to snuff–not that they don’t have their own ghettos. Unfortunately, time and again those stereotypes are borne out in real life. Homeowners barely scrape by, making do with what they’ve got, saving every scrap in case it might be needed. Or they’re renters unwilling and/or unable to improve on a place they’ll never own and whose owner can’t be bothered to make needed repairs. Or people whose lives have run over them with injuries or job loss or a litany of emotional defeats that leave them incapable of trying to make things better. There are no zoning laws in Washington County that require people to clean up junk piles or dead vehicles or really much of anything. It wasn’t until the last couple of decades that an ordinance was passed requiring that electrical wiring standards be met in rural housing and that came about only after children died in a fire caused by poor wiring. Laws forbidding the surface disposal of sewage passed only a short time before that, and even now a properly-built outhouse remains legal despite the karst geology that allows pollutants to rush right through fractured layers of rock and loose soil to percolate into groundwater that surfaces as springs and streams. All of it, including discharge from septic tanks, ends up in Beaver Lake which supplies drinking water for the entire region. It wasn’t until the late 1980s that landfills were required to monitor discharge and place liners under the trash. Some efforts have resulted in the cleanup of junkyards where vehicles in various stages of decay leak oil, gasoline, and various other noxious fluids into the waterways. Other efforts attempt to stop residents from openly burning trash, a practice that releases toxic chemicals like dioxin, furans, and dangerous particulate into the air we all breathe. But there’s a mindset lurking in the minds of our people, that this is their place and they can damn well do what they please. 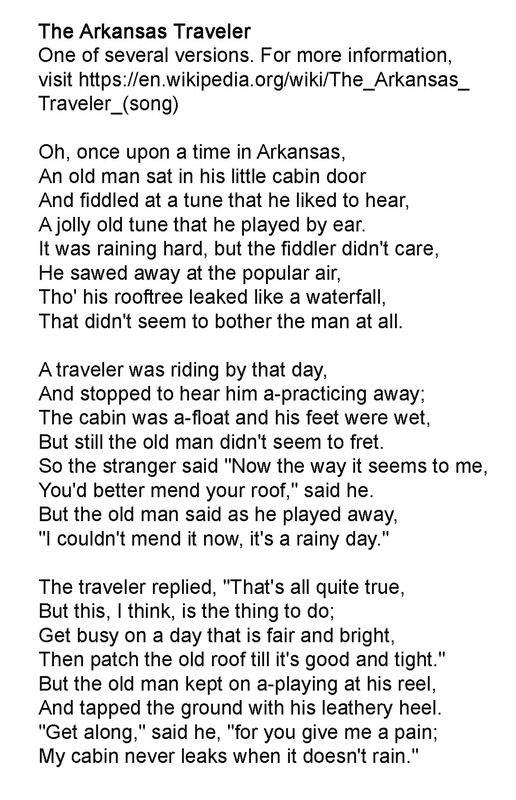 This entry was posted in Local History, Rural Living and tagged Arkansas Traveler, Highway 71, hillbillies, Ozarks, pollution, poverty, scenic route, the natural state, trash on March 19, 2018 by Denele Campbell.